A plain young hatter named Sophie has her life changed when an evil witch transforms her into an old woman. Unable to face her family in such a condition, Sophie runs away in search of a way to become young again. Along the way, Sophie helps a turnip headed scarecrow, who repays her by leading her to the moving castle owned by the dreaded wizard Howl. There she befriends Howl's apprentice Markl, Howl's fire demon Calcifer, and eventually, Howl himself. 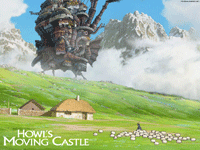 Sophie then becomes the castle's cleaning lady in an effort to not only find the solution to her problem but to save Howl from his own terrible secrets as well.